Founded in 1982, The American Herbal Products Association is the oldest of the non-profit organizations that specializes in service to the herbal industry. It is the voice of the herbal products industry and the recognized leader in representing the botanical trade. 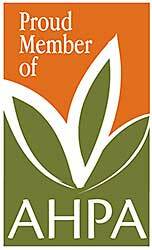 With more than 280 members, AHPA’s membership represents the finest growers, processors, manufacturers and marketers of botanical and herbal products. Is active in communication with key legislative allies—as well as critics—in the U.S. Congress. Maintains regular communication with the many federal regulatory agencies with jurisdiction over this industry, including the Food and Drug Administration, the Federal Trade Commission, the U.S. Department of Agriculture, the U.S. Fish & Wildlife Service, and others. Maintains relationships with key scientists and organizations that conduct research on herbs and botanicals. Plays an active role with the various standards-setting organizations involved in the herbal trade. Is in constant communication with reporters and publishers in our quest to improve the quality of information about herbs and botanicals. AHPA Herbal Industry Leader Award. In 2013, Trout Lake Farm was the recipient of this award with special recognition of Martha Jane Johnson, who was retiring after 40 years with the farm. The award recognizes companies that set an example of outstanding business practices or organizations that work to move the industry forward above and beyond normal business practices. 2017–18 AHPA Board of Trustees. Heather Folks-Lambert, Trout Lake Farm’s QA Manager, contributes a unique grower’s perspective to the board and their mission. Trout Lake Farm is also affiliated with the following fine organizations. The mission of the American Botanical Council (ABC) is to provide education using science-based and traditional information to promote responsible use of herbal medicine—serving the public, researchers, educators, healthcare professionals, industry and media. Since 1988, ABC has been educating consumers, healthcare professionals, researchers, educators, industry and the media on the safe and effective use of herbs and medicinal plants. ABC is an independent, nonprofit organization supported by thousands of members around the world. The Council for Responsible Nutrition (CRN), founded in 1973, is a Washington, DC-based trade association representing ingredient suppliers and manufacturers in the dietary supplement industry. CRN members adhere to a strong code of ethics, comply with dosage limits and manufacture dietary supplements to high quality standards under good manufacturing practices. The USDA develops, implements and administers national production, handling and labeling standards for organic agricultural products. The USDA also accredits the certifying agents (foreign and domestic) who inspect organic production and handling operations to certify that they meet NOP standards. Organic Trade Association (OTA) is a membership-based business association that focuses on the organic business community in North America. OTA’s mission is to promote and protect the growth of organic trade to benefit the environment, farmers, the public and the economy. OTA is a proud member of The International Federation of Organic Agricultural Movements (IFOAM). The WSDA Organic Food Program, a USDA-accredited certifier, upholds the integrity of the organic label through certification and inspection of organic crop and livestock producers, processors, handlers and retailers. The Columbia Land Trust conserves and cares for vital lands, waters, and wildlife of the Columbia River region. They focus their work from the John Day River east of the Cascades to the Pacific Ocean, reaching about 50 miles from the Columbia into both Oregon and Washington. About one third of the Trout Lake Valley Farm is given an easement from the CLT to use this land for organic agricultural purposes.